CloseiThe Other Guys perform “‘Twas the Night Before Plots” at their Annual Holiday Concert at Foellinger Auditorium on Saturday, Dec. 1, 2012.Daryl QuitaligiThe Other Guys perform “‘Twas the Night Before Plots” at their Annual Holiday Concert at Foellinger Auditorium on Saturday, Dec. 1, 2012.Daryl QuitaligDaryl QuitaligiThe Other Guys perform “‘Twas the Night Before Plots” at their Annual Holiday Concert at Foellinger Auditorium on Saturday, Dec. 1, 2012.It was the intermission of the 1968-1969 Varsity Men’s Glee Club concert. The director walked onto the stage to introduce a new group performing for the first time. 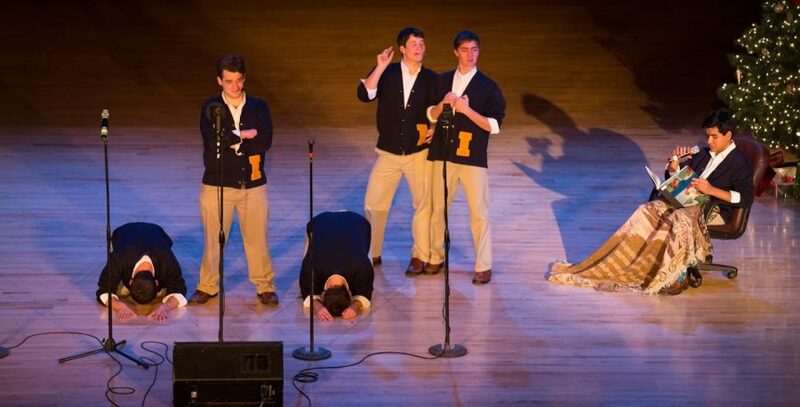 “Well, guys, you just heard the University of Illinois Varsity Men’s Glee Club,” he said into the microphone. “And now for the … ” He paused for a moment; the next group didn’t have a name yet. “The Other Guys,” he finished. The Other Guys were born on that night 50 years ago, and they have been growing in popularity and size ever since. Simon Tiffin, senior in LAS, is currently a member of the group. Tiffin said Bruce Johnson, a master’s student in the 1968-1969 school year, was a member of the Varsity Men’s Glee Club when he wrote their famous song about the Morrow Plots. He and a few of his classmates who were in glee club loved choir but wanted to have a smaller group. They got together and formed The Other Guys.